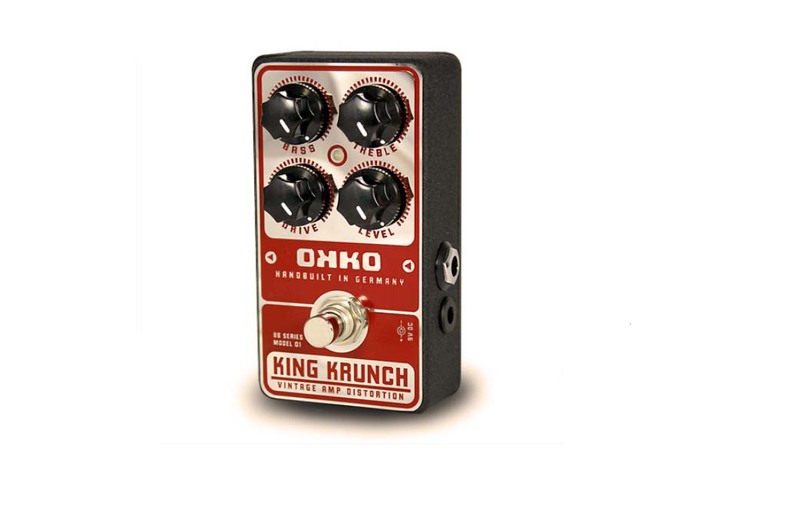 Great new pedal from OKKO! + + + "The first pedal in our BlackBox series. The Krunch King lives up to it’s name, delivering the sounds of cranked up vintage amps – full bodied, raw, dynamic – the sound of rock’n’roll. The lowest gain setting gives you get a quite unaltered clean sound, turning up the drive control then introduces harmonics and slight compression, and natural breakup when you hit the strings harder, just like the real thing. Turn it up more and you get all the growl and punch of a cranked non-master amp, fully in control of your picking dynamics and guitar volume. Even with the drive all the way open you can go back to a clean rhythm sound just by rolling off your guitar volume. The passive tone controls are not there to bend the sound but to dial in the perfect tone with your gear. Even at extreme settings, the Krunch King never sounds artificial, harsh or fizzy."